CONGRATULATIONS to CoolArts! Grand Opening – You’re Invited! Congratulations to the CoolArts Society on their new studio space at the Rotary Centre for the Arts! Celebrate their Grand Opening on Friday, March 9th. Details below! Learning opportunity this week in Kelowna – check it out! Our first annual Supported Employment Conference is drawing near and we are getting very excited and hope to generate a little excitement in all of YOU ! So often many of us wish we could attend more conferences but find the cost to travel to the lower mainland way out of our training budget allowances. Here is an opportunity to attend something local and hopefully very meaningful to the excellent work all of you do here in the Interior. The committee has updated the conference schedule which is attached as we have a new guest presenting at our event on day two. His name is Ean Price and we are thrilled that he will be participating during the breakfast portion of our day. He will be demonstrating a Lip Sync device that makes it possible for someone with physical limitations to be able to complete many tasks related to employment. Ian Price is also a rep for the North American Society of Tetra and will provide us with a short power point presentation about this great organization that supports the development of unique adaptations for the work place as well recreational and personal pursuits. We understand that at times it is hard to juggle those staffing schedules to free staff to attend training events hence why we tried to keep the hours on each day short. We hope you will see the value in ensuring you are represented at this wonderful event. We hope to make this an event we can build on and provide more often in the future, but first we need you to assist us in making this a great conference and one you want to return to again someday in the future. Come for the food, stay for the value in learning and leave with a renewed interest and excitement in the work that you do and or want to do in the future. CANUCKS TRIP – April 2018! It’s time for a VANCOUVER TRIP – join the community support team in taking in a Vancouver Canucks hockey game and a visit to the Vancouver Aquarium April 5-6, 2018! This is sure to be a great trip, so sign up to reserve your spot! Sign up is first-come, first-served. Check out the info on this flyer, or give Joel a call (1-888-491-2907 ext. 104). We have also put this info on our Facebook page! Please note: individuals may be eligible for a subsidy through the MSDSI office, take the flyer to the office and ask for assistance to pay for the trip. Great opportunity to get involved in some online learning, with a fantastic lineup of professionals! Thanks to COPCS for circulating info on the 2018 Healing Addiction Summit (see below). Click on the links to find out more. As we head into this new year, we wanted to share an important event that Dr. Maté is a part of, as well as upcoming speaking engagements. Chances are, you or someone you know has been affected by addiction of some type. Addiction is a problem that still has a lot of shame around it, so it’s something we don’t talk about enough in general. And partially because of that, it’s an epidemic that is tearing apart families and communities. Please join Dr. Maté and over 25 of the world’s leading experts, practitioners, and visionaries for the Healing Addiction Summit, where he talks in-depth about his book Hold On To Your Kids, and about reawakening healing parental instincts. You can register for this free event here. If you know somebody in your life who would benefit (particularly someone who has a family member or loved one who is battling addiction), then please share with them by forwarding this email. In April, Dr. Maté will present at the Advancing the Art & Science of Psychotherapy conference in Orange County, California, where he will present The Myth Of Normal: Depression, Anxiety and Addictions from a New Perspective. In June, Dr. Maté will be in Belfast at the Trauma Summit, speaking on ADD and other childhood developmental disorders, Fostering Resilience in a Stressed Culture, and giving presentations on topics covered in his best-selling books When the body Says No and In the Realm of Hungry Ghosts. He will also be in Cork, Ireland at the end of June and early July at the Health & Healing Through Mind/Body Unity event. On August 2nd & 3rd you can find Dr. Maté in Melbourne, Australia speaking to the Australia Childhood Foundation on the theme of Trust and Betrayal: Therapeutic Interventions that work in the Face of Relational and Complex Trauma. In November of this year, Dr. Maté heads to Stavanger, Norway to present a lecture and seminar during the Schizophrenia Days event, where he will presenting When the Body Says No: Mind/Body Unity and the Stress-Disease Connection, Compassion Fatigue: Caring for our Ourselves while Caring for Others and The Hungry Ghost: A Biospsychosocial Perspective on Addiction, from Heroin to Workaholism. For a full list of upcoming speaking events, please visit our website. Later this year Dr. Maté will be launching online educational courses in his unique approach to addiction. Please stay tuned for more information. Copyright © 2018 Dr. Gabor Maté, All rights reserved. 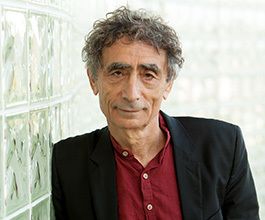 You are receiving this email from Dr. Gabor Maté because you opted in at drgabormate.com.